This month, I would like to present one of my favourite thinkers and writers, Janusz Korczak. I looked through the books now in print translated from Polish, and I must say, I was hard put to find a book that I could call Christmas-y, or even festive. Polish literature has a serious bent, and though Gombrowicz might be funny, he isn’t holiday material. Which brought me finally to Korczak, whose work, if not about Christmas, is about children and hope in the next generation. 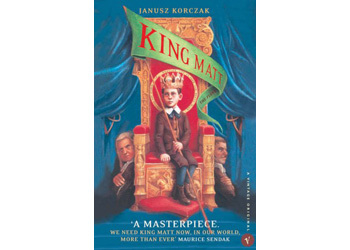 So for this month I’ll introduce Janusz Korzak’s King Matt the First, a fairy tale about a young boy who becomes king. Janusz Korczak is the pen name of Henryk Goldszmidt, a Polish-Jewish children’s author, paediatrician, and child pedagogue. Born in Warsaw in 1878 to a well-off assimilated Jewish family, Korczak’s family hit hard times when his father died, and Korczak became the breadwinner of the family. He studied medicine in Warsaw, finishing his degree in 1904, was drafted into the Russian army for the Russo-Japanese war, then returned to Warsaw to become a paediatrician. By 1911 he became the director of an orphanage in Warsaw, a role he continued to the end of his life when he was murdered in Treblinka together with the children in his charge. It is his last march to the trains, together with his children, that he is often remembered for. But his work in children’s education was truly visionary, and much of it was expressed in King Matt the First. As well-known in Poland as Peter Pan in the English-speaking world, King Matt was published in 1923. When little Matt becomes king after his father dies, he is suddenly thrown into the dangerous waters of power. Sensing a power vacuum that a child has become king, the three neighbouring countries immediately invade (Russia, Prussia, and Austria?). King Matt escapes from his custodians to defend his country, achieves victory, and returns a hero. But all is not well in his native land. Overly generous, King Matt didn’t demand reparations from the invaders, and has to go back to the neighbours to borrow funds for his war-torn nation. He begins a series of reforms to improve the life of children. Summer camps are launched for all children, all schools must have see-saws, and a zoo is built in the capital. In building a zoo, King Matt travels to Africa, becomes friends with the rich King Bum Drum, and returns to his native land with the Princess Klu Klu, and begins an even greater series of reforms, instituting a children’s parliament, and a children’s newspaper. Nothing works out quite like he plans, though. The summer camps were poorly managed messes which none of the children liked, and the Parliament of Children ends up a travesty, making demands like the abolition of girls and little children. Eventually through the machinations of his neighbours King Matt is deposed and exiled. But by the end he is a wiser king, albeit without a kingdom. At a time when children were supposed to be seen and not heard, and beating was an acceptable part of pedagogy, Korczak was a visionary. In his orphanage he initiated a children’s newspaper, a children’s parliament, and most crucially, a child’s court, very much as King Matt did. Like in King Matt, sometimes it worked, sometimes there was chaos. But always the principle prevailed, that children, those who by their nature have no power, nonetheless have rights. They have the right to make demands, to set conditions and to have reservations. And the right to be heard; the right adults are often the most loath to give, because how often were they listened to when they were children? A beautiful book, written by a beautiful person who gave his life for the children he loved, highly recommended by Massolit.